The ViArt Affiliate program provides website owners with the prospect of referring potential customers to Viart.com and earning money from every purchase made. Viart Shop is quickly evolving into one of the best shopping cart solutions around with a growing array of advanced features. This means that you, as a site owner, can potentially earn a great deal of money by simply referring customers to Viart.com. 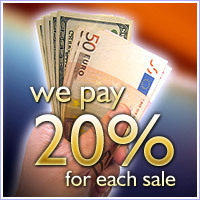 When users are referred to Viart.com and buy a product from Viart, you, the referrer, get 20% commision of the total purchase value. When users are referred to Viart.com and order Custom Work from Viart then you receive 10% commision of the total purchase value. You are able to track all commissions via Commissions Monitor. The commission is paid on a monthly basis. The commission will be paid consecutively given that you have earned $100 plus in commission. If not, the commission will roll onto the next month and will be paid once you have reached $100. ViArt Shop Enterprise (Multiple Site Edition) [price]1399[/price] [price]279.80[/price]! Want to become our affiliate? It is easy and absolutely free.